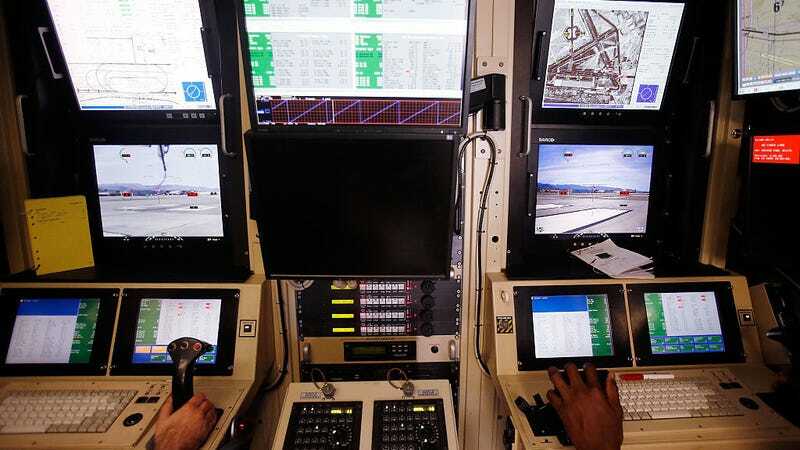 Airmen use a ground control station cockpit to control remotely piloted aircraft (RPA) during a training mission at Creech Air Force Base on November 17, 2015 in Indian Springs, Nevada. DigitalGlobe, a Colorado-based firm that specializes in geospatial imagery, reportedly provides images and algorithms to Project Maven. 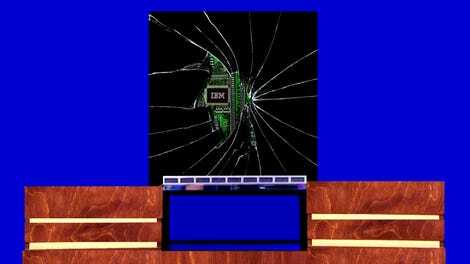 IBM has been approached about participating in the project by using artificial intelligence to analyze streaming video, a person familiar with the exchange told Gizmodo. Nvidia has also indicated interest in the project, but it’s not clear whether either company has an official contract to work on Maven—IBM says it does not, while Nvidia declined to comment. DigitalGlobe did not yet respond to a request for comment. Google’s official contract for Maven is through a third-party agency, ECS Federal, an arrangement that helps obscure the amount Google is paid and other contract details. Multiple Google sources told Gizmodo that executives have described the company’s Maven contract as being worth about $9 million, although cloud contracts tend to be priced in tiers based on data use; Google’s ultimate earnings from the project could end up being much higher. A Google spokesperson did not respond when asked about the figure. IBM offers a range of artificial intelligence services under its Watson branding, named after the company’s founder, Thomas Watson. IBM has historically taken on military contracts and maintains strong business partnerships with the federal government—so the company may be a more natural fit for Project Maven than Google is. Watson is currently used to predict maintenance needs for an Army fleet of armored vehicles, reports Trajectory, a magazine published by the non-profit United States Geospatial Intelligence Foundation. The chipmaker Nvidia, which has experienced a recent bump in its stock price as it pushes artificial intelligence products, has also closely associated itself with Project Maven. Nvidia representatives have spoken publicly at events related to the project, invited Maven representatives to speak at corporate events, and even testified before Congress about Maven. A Nvidia spokesperson declined to clarify the company’s involvement in Project Maven. During Congressional testimony in February, Nvidia’s vice president and manager of its Tesla business, Ian Buck, cited Maven as an exemplary project for swift government adoption of artificial intelligence. “Using AI for aerial reconnaissance holds great promise to alleviate airmen from having to stare at screens for eight hours a day looking for a problem,” Buck explained. The Department of Defense declined to elaborate on its contracts with specific tech companies but said that it works with a variety of vendors on Maven. Project Maven stands to benefit greatly from its partnerships in the private sector. More than a thousand analysts have labeled images to provide training data for Maven’s algorithms, which includes algorithms developed by DigitalGlobe. But as of early this year, those DigitalGlobe algorithms were only able to deliver a 70 percent accuracy rate, according to Trajectory. Partnerships with leaders in the AI field, like Google, IBM, and Nvidia, could boost that rate. And although Google employees have pushed back against their company’s involvement in Project Maven, it’s not clear that employees at other companies would do the same. In a petition asking Google to terminate its contract, Google employees acknowledged this possibility. “The argument that other firms, like Microsoft and Amazon, are also participating doesn’t make this any less risky for Google. Google’s unique history, its motto Don’t Be Evil, and its direct reach into the lives of billions of users set it apart,” they wrote. However, Project Maven—and its affiliation with drone warfare—may be where IBM employees draw an ethical line. “There are many tech workers at IBM who will outright reject projects that facilitate illegal drone strikes and other human rights violations internationally by the U.S. military,” said an IBM employee who requested anonymity because they are not authorized to discuss IBM’s engagements with Project Maven. A petition launched by the Tech Workers Coalition in mid-April asks IBM, along with Google, Amazon, and Microsoft, not to accept Pentagon contracts, citing objections to Project Maven. If companies like Google want their employees and the public to trust their decisions to accept military AI contracts, transparency is crucial, says Miles Brundage, an AI policy research fellow at the University of Oxford’s Future of Humanity Institute.